Tracy Fenney and MTM La Costa, owned by Mr. and Mrs. Ken MacKenzie, on course in Sunday's $10,000 Devoucoux Hunter Prix at HITS Ocala. OCALA, FL (February 22, 2011)--In a weekend that saw a record number of entries in several divisions, including two record-setting highs for Grand Prix entries, Sunday’s $10,000 Devoucoux Hunter Prix was the icing on the cake. An outstanding 70 pairs started on a course designed by Tim Hott of Tennessee, as a mix of Professionals, Amateurs, and Juniors were awarded the top ribbons. Tracy Fenney of Flower Mound, Texas brought her Sunday best when she took home the first-place ribbon aboard MTM La Costa, owned by Mr. and Mrs. Ken MacKenzie. Out of the 70 trips in the first round, the pair received the highest score of 87, and then an 84.5 in the second round for a total of 171.5. Fenney, a Grand Prix veteran, showed her versatility on the hunt field and also picked up the fourth-place ribbon aboard Kaitlyn Arnold’s Dylan. 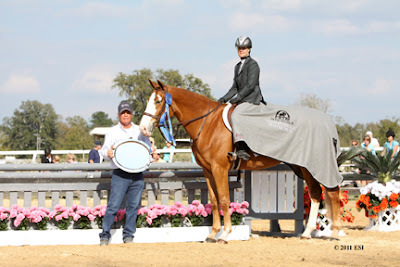 A class filled with a great variety of both Professional and Amateur riders saw talented Junior rider Meg O’Mara of Rumson, New Jersey aboard Walk the Line, owned by Don Stewart and O’Mara, emerge right behind Fenney as the second-place winner. She scored an 86 in the first round and an 85 in the second round for a total of 171, just half a point behind Fenney. Tracy Fenney is joined in the winner's circle by husband Mike McCormick after she and MTM La Costa bested 70 other horse and rider teams in Sunday's $10,000 Devoucoux Hunter Prix at HITS Ocala. In addition to the blue ribbon and a beautiful, engraved silver tray, Fenney also received a cooler courtesy of Judy's Tack Shop. 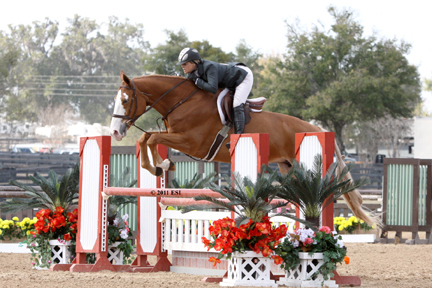 With four weeks of competition remaining, O’Mara plans to show at HITS Ocala for the rest of the circuit before she travels to HITS Culpeper and HITS Saugerties to compete in the spring and summer series where she hopes to cement her place at the Diamond Mills Hunter Prix Final, which takes place September 10-11 at HITS-on-the-Hudson in Saugerties, New York. The Diamond Mills $500,000 Hunter Prix Final has been one of the most widely talked about events in the show jumping industry this year, and riders from coast-to-coast are competing to qualify for this historic event. O’Mara’s performance on Sunday is a testament to the opportunities available for Junior riders looking to earn a spot in the Final amongst Professional and Amateur riders. Professional rider Kate Conover, who works at Redfield Farm and lives in Ocala, showed Doreen Toben’s Black Tie Affair to the third-place ribbon with a total of 170.5. Another Junior rider, Callie Morgan Smith from Bernardsville, New Jersey, finished fifth aboard Sagaro, owned by Smithfield Farms, LLC, with a total score of 166. Sunday’s $10,000 Devoucoux Hunter Prix represents the largest starting field of any Diamond Mills Qualifier to date. With the win, Fenney now sits at number six in the Rider Rankings with 101 points and two of the five classes needed to become eligible, while O’Mara rocketed into the top 10 with 90 points aboard Walk the Line. For the updated Diamond Mills Hunter Prix Final Rider Rankings, please click here. The Ocala Masters begins today and will be highlighted by the $25,000 SmartPak Grand Prix, presented by Pfizer Animal Health, on Thursday, February 24, the $15,000 M&S Child/Adult Jumper Classic on Saturday night, February 26, the $5,000 Devoucoux Hunter Prix on Sunday, February 27, and the $50,000 Strongid C 2X Grand Prix, presented by Pfizer Animal Health, on Sunday, February 27. All Grand Prix and Devoucoux Hunter Prix events this season are qualifiers for the 2011 Pfizer $1 Million Grand Prix and inaugural Diamond Mills $500,000 3'3" Hunter Prix Final, respectively, which will take place September 10-11 at HITS-on-the-Hudson in Saugerties, New York.